Normally on Veteran's Day, I plan a full day adventure, but alas, I had a dentist appointment today in the afternoon. What was I thinking? I was, however, able to get out for a morning hike. 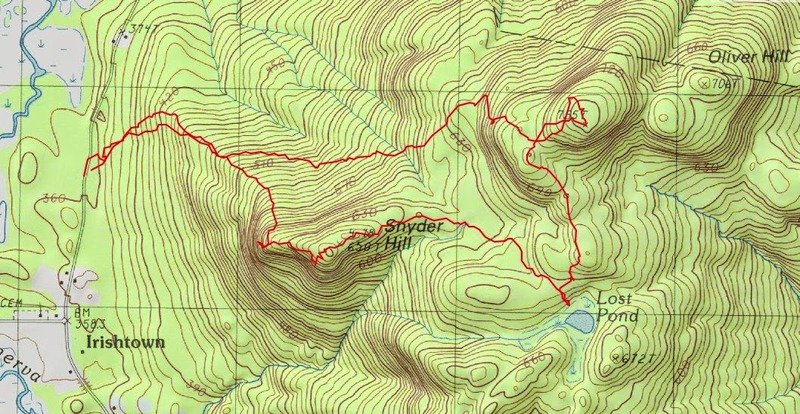 On my short hike list was Snyder Hill in Irishtown (between Schroon Lake and Minerva). I had noticed that Snyder Hill (2115') looked impressive when I had been driving in Irishtown. It looked like there would be some nice views to the west. With the leaves down, I could see some craggy rock and ledge near the top of the mountain. 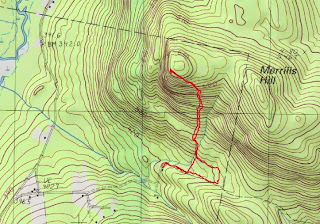 I found a place to pull the car off the road on a piece of State Land on Hoffman Road on the west side of Snyder Hill. I entered the woods in a damp section of hemlock, but it didn't last. 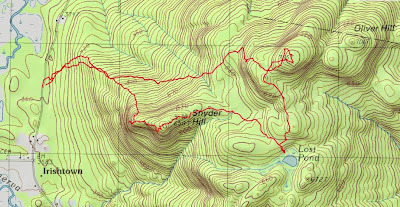 I gained the ridge to the NW of Snyder and followed it SE up through a nice oak and beech forest. I was able to make my way quickly up the open ridge and 30 minutes later, I was on top of the rock ledge I had seen from below. Someone had built a cairn on the ledge. From this vantage point, I could easily see Irishtown below me. A little further in the distance I could see the Town of Minerva, Moxham Mountain and Gore Mountain. From the ledge, I made my way up to the true summit which was just a couple minutes to the east. No real views from the summit. 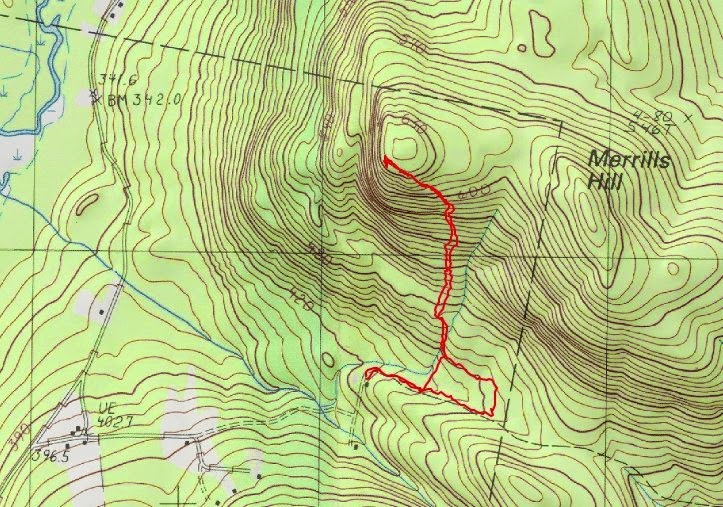 After the summit, I continued easterly to go in search of Lost Pond. East of the Snyder Hill summit, I encountered brambles for quite a distance. They were not so bad this time of year, but are probably annoying in the spring and summer. I found Lost Pond, arriving from the NW, but the pond was surrounded by wet marsh, so I didn't reach the water's edge. From the pond, I turned north to climb Oliver Hill (2305'). Almost immediately, I came across a hunters tree stand. 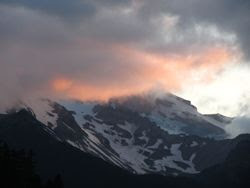 The easiest approach to Oliver appeared to be climbing the false summit to the west, then hike east to the true summit. I had no problem using this route. I bypassed a band of cliff guarding the west end of the true summit by staying right of them. The summit of Oliver Hill had no real appeal. Hemlocks blocked any view, and there were no real interesting features near the summit. Unimpressed with this summit, I made my my westward to return to the car. Ireached the car at 11:15 and had a little more time to hike, so I revisited nearby Merrill Hill (off Trout Brook Road in Olmsteadville) to reclimb this nice little gem. Merrill offers a nice ledge and view westward and it took me an hour to complete this nice little hike. Someone has flagged a south up Merrell, and have now nailed metal can lids painted blue on the trees. On the ridge they've built mini cairns. At the ledge, I found someone (probably the same people) had decorated a small pine tree with four red Christmas ornaments!